Abuja — President Muhammadu Buhari has reiterated the resolve of his government not to spare any Nigerian involved in any corrupt practice. Buhari, who appeared alongside Vice President Yemi Osinbajo, at a town hall meeting tagged 'The Candidates' organised by the MacArthur Foundation in collaboration with NTA and DARIA Media in Abuja wednesday, emphasised that the anti-corruption stand of the present administration is now being pursued with vigour. The president who had earlier noted that his anti-corruption crusade could not have similar impetuous as his first coming as military leader said, "I told you why I have to be careful. If there are strong allegations and there are evidence; bank accounts, names of companies noted, contracts awarded, then we will take them before the court through the EFCC and ICPC, and we have to trust the system and allow them to complete their investigations. "If we just take people in as we did during the military and we just lock them up, the present multi-party democratic system does not approve of that. If you have accused a person, you have to prove that in court for him to be prosecuted. "So, if there is strong allegation, the government may decide such people should go like the former SGF you mentioned; we asked him to go." Asked why Babachir has not been prosecuted if there is strong evidence to ask him to go, which is an indication that may be he did something wrong, Osinbajo who interjected said, "I think the matter is already before the EFCC and I believe that a directive has been issued regarding all persons who have cases before EFCC. I am sure that you will find that each and every person that has been duly investigated will be put on trial." 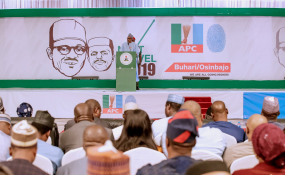 Emphasising that his government has not condoned corruption, President Buhari stated, "I don't think that there is anybody that has been brought out as corrupt in the last dispensation, which we looked in the other direction. "I think I can best illustrate my experience on this; when I came in uniform in 1984, we arrested the president, the vice president, governors, and ministers and put them in detention and said they are guilty until they can prove themselves innocent. We put committees of investigation and based on geopolitical zones, those that were investigated, except two Nigerians, late ... .Usman, a junior minister in the Ministry of Education and then late Adamu Ciroma, a governor of the Central Bank and the Minister of Finance, were the only people who were found to have managed their resources with integrity. "But I myself was eventually arrested and detained and those people who were found guilty of misappropriating public funds were given back what was found to have been misappropriated through committee investigation." Apparently making reference to the ongoing litigation against the Chief Justice of Nigeria (CJN), Justice Walter Onnoghen, who is currently facing litigation at the Code of Conduct Tribunal over alleged non-declaration of assets, Buhari said, "So, I decided to come now and I have to be careful. People are not just arrested like that but once they hold positions, if they made a wrong declaration, it is just one point; they didn't mention how many houses they have in Europe, America and Asia and they didn't mention the companies they floated, the contracts they gave, which is eventually uncovered, they are faced in court with the document." He said, "We have shown evidence, I think since then we have not gotten a reply from them." On military spending and complaints about poor welfare and equipment for the soldiers, Buhari said he was not convinced that things were that bad with the country's military. "I believe that the system is still working otherwise there will be serious break down of law and order," he said. "My take on that is that if there is misappropriation of public funds, there are ways of prosecuting those involved appropriately," he said. He also highlighted some efforts being made by the present administration to address rising poverty, which include the "trader moni" programme being implemented to get persons at the lower rung out of poverty. "We want Nigerians to remember where we were in 2015, where we are now and where we are going," he said. "Well, it will not be the first time I would lose an election. I lost in 2003 and went to court for 30 months. I lost in 2007 and went to court for 18 months. I lost in 2011 and went to court for eight months, all the way to the Supreme Court. What they were doing at the time was to write marks and said anyone who disagreed should go to court. But God dey," he said. "I don't know how much technology they used. Thank God the court and the House of Assembly are handling it. Hopefully before I go for campaign in Kano, the matter would have been resolved," he said. Also asked on his administration's solution to the conflict between farmers and herdsmen, Buhari said there had been grazing routes since the First Republic and hence, the Benue State Governor ought not to merely ban grazing but also ought to make arrangements for grazing routes.